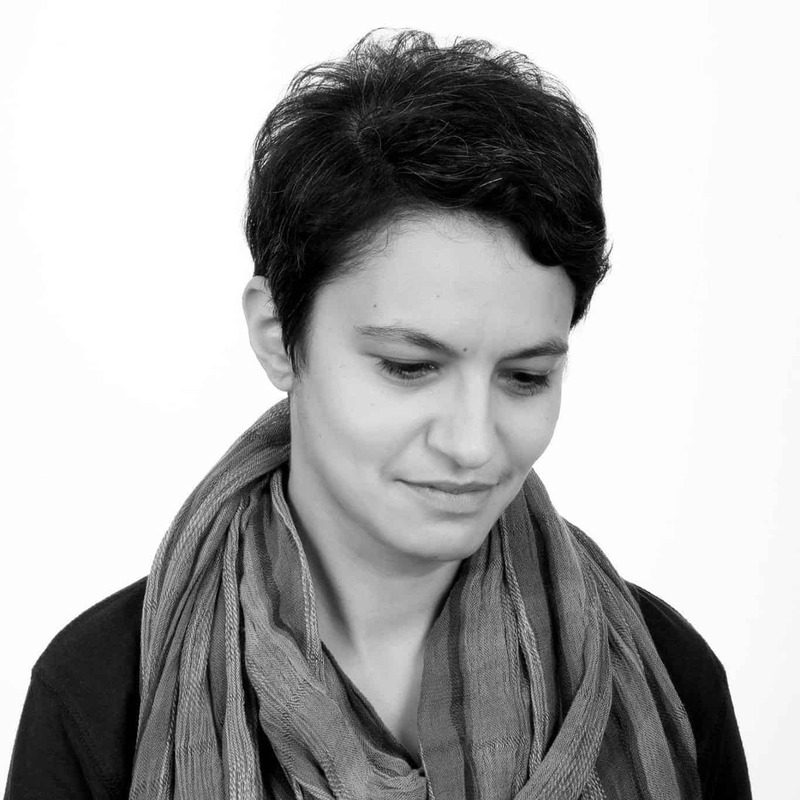 Eftychia Giannaki is the author of the Trilogy of Athens, a crime fiction series set in contemporary Athens featuring a homicide detective Haris Kokkinos. She was born and raised in Athens. She studied computer science, music technology, and communication and she has worked for several years in secondary education. 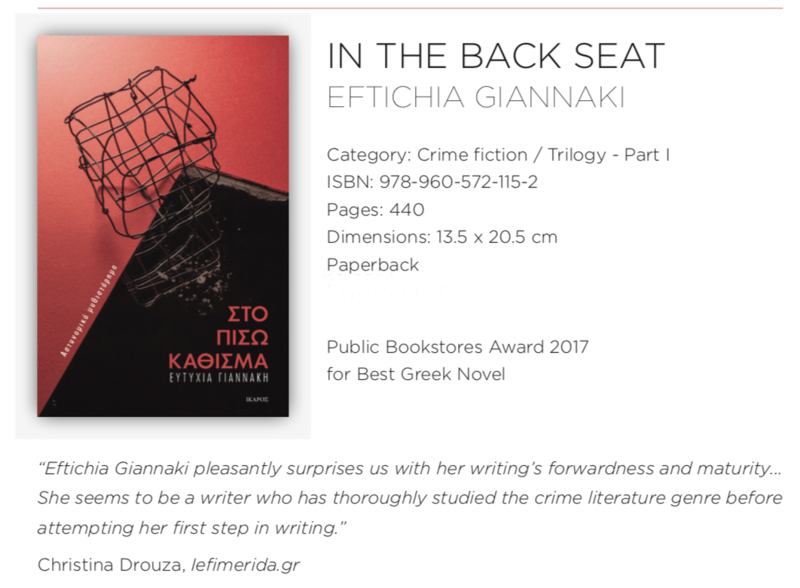 / The first book in the Trilogy, In the Back Seat (Ikaros Publishing, 2016) won PUBLIC Prize for Best Greek Novel of 2017. The first story of the crime novel series starring police officer Haris Kokkinos. A theatrical director is viciously murdered in the basement of Plaka Theater in Athens, Greece. Police officer Haris Kokkinos and his colleagues must unravel a case expected to attract public attention. They will soon realize that the motive is hidden in the director’s dark past, and start detangling a thread of common secrets, dissimulation, and violence, in the heart of the city. The investigations build a fresco comprised of Athenian citizens, starring in a story that would not have existed if the city did not exist, and nothing will be left in the darkness under its bright sun. 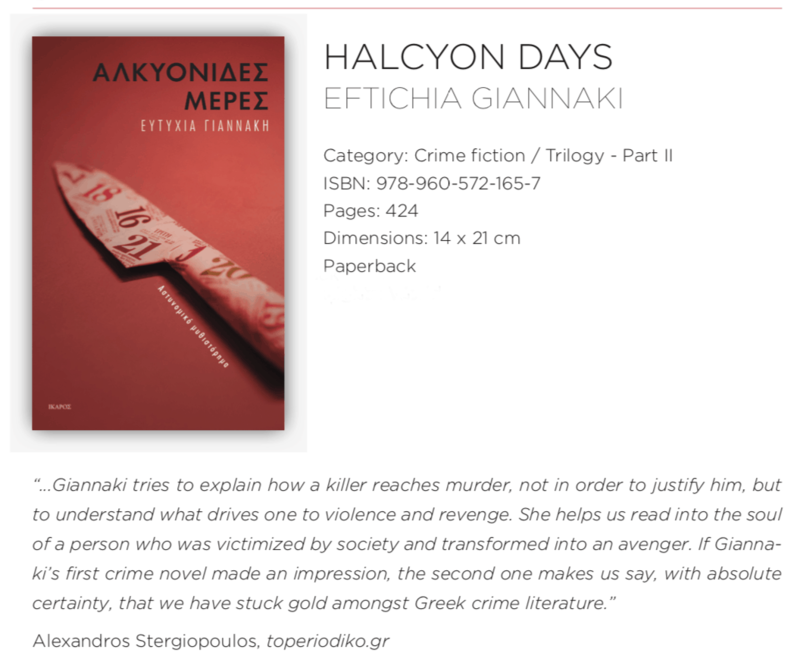 / The second book, Halcyon Days (Ikaros Publishing, 2017) was shortlisted for the PUBLIC Prize for Best Greek Novel of 2018 and the Literary Magazine KLEPSYDRA. A young girl from Ghana is found murdered, at the largest shopping center in Athens, Greece. Police officer Harris Kokkinos and his team are summoned to deal with a case wrapped around them like a ball of yarn, while the clock is ticking. The maelstrom in which the detective will be found, including his past and the relationship with his jailed son, will force him to balance on a tightrope in order to shed light on the case and ultimately to himself. In a society unable to protect the weak no one can be considered innocent. / The third book, City under the light (Ikaros Publishing, 2018) has just been published. Two of her plays have been staged in the Greek theatre. “The mammals” was one of the best three plays of Young Play Writers Lab of Michael Cacoyannis Foundation and was published and translated in English (Scriptwriters Guild of Greece, 2017). She currently lives in Athens.